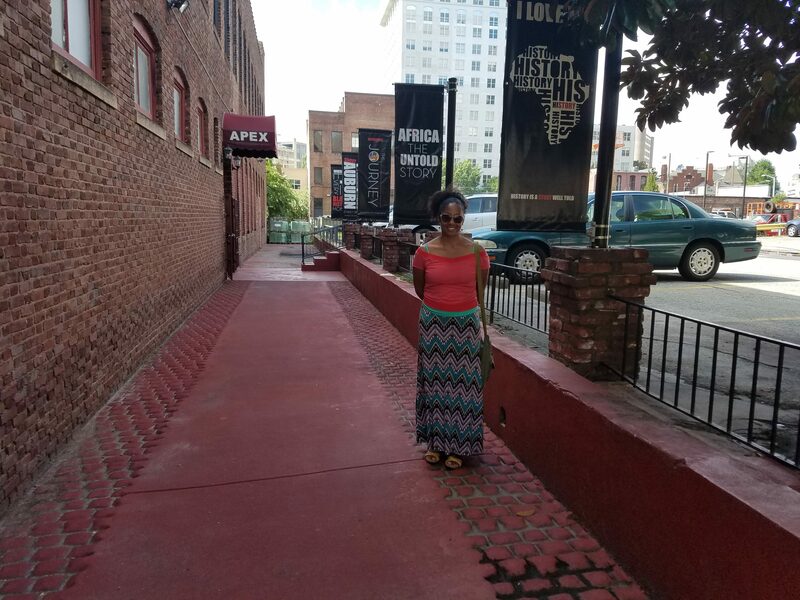 In February when I first visited Atlanta with Our Museums in mind, I had not heard of the APEX (African-American Panoramic Experience) Museum. 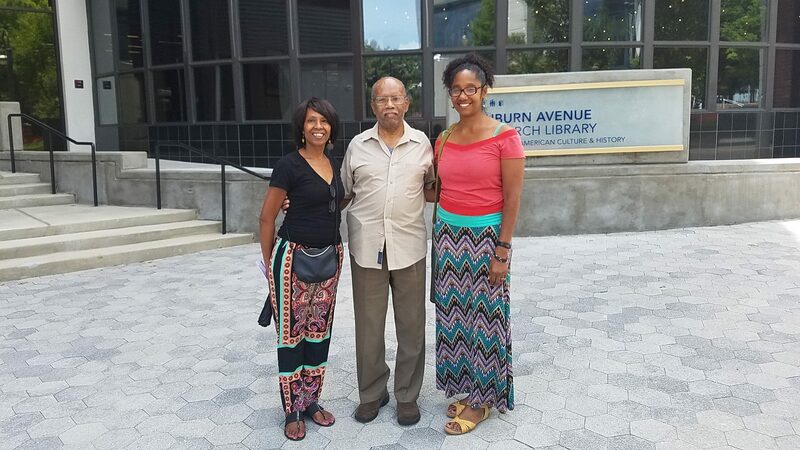 I was glad to have a chance to return after an Atlanta-native museum professional at the August Association for African American Museums Conference said it was a must-see. A visit to the APEX, “Where every month is Black History Month,” starts with a screening of two ten-minute films, the first titled The Journey of Africa and narrated by Ossie Davis, uses mostly a slideshow of paintings to chronicle a somewhat selective history of African peoples from Ancient Egypt to video footage of President Obama accepting the 2008 nomination. 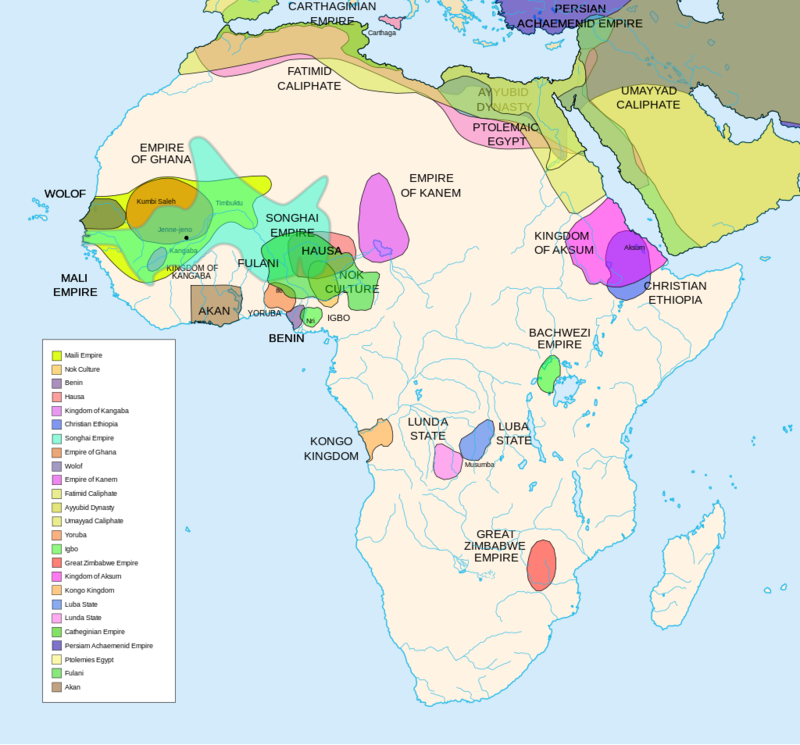 Like the museum’s exhibits, the video shows an alternative view of Black history by including powerful Ancient Egyptians along with other known pre-colonial African leaders like Queen Nzinga and Sundiata Keita and highlighting slave rebellions rather than simply describing the horrors of slavery. The video ends with a drawing of a redesigned, updated, and rebuilt Apex museum with a dramatic, high-ceilinged glass entry and many visitors milling about. The second video intends to educate viewers about the Sweet Auburn neighborhood in downtown Atlanta. It is narrated by Cicely Tyson and Julian Bond and opens with a voiceover of Tyson reading a poem of rhyming couplets whose speaker is Sweet Auburn itself. The image on the screen is of a woman doing a modern dance on an old-timey set. The history of the neighborhood read by Bond begins with James Tate, a Black business owner in the area in the late 19th Century. The businesses that sprout up as the area becomes populated with more and more African-Americans like insurance companies, banks, and the ironically named European Hotel, the first hotel to serve Black guests in Atlanta. This growth in the Black population and boom in successful Black businesses led to the 1906 Atlanta riots. After that, Atlanta was strictly segregated until the 1950s. Bond, of course, explains that some of the civil rights movement activity started in Sweet Auburn where Martin Luther King Jr. was born and raised, where the SCLC started, and where busses were desegregated in 1959 because of the Love, Law, Liberation Movement, led by a group of Black pastors. 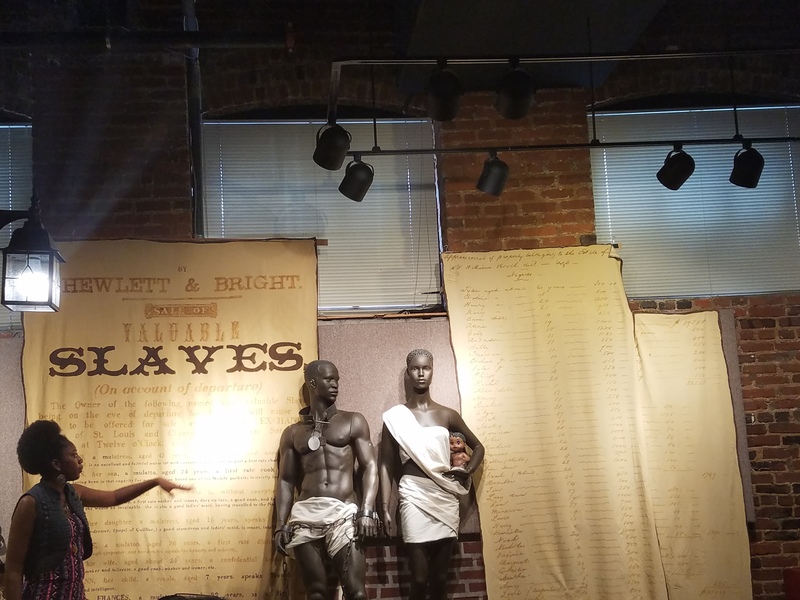 The video ends as it begins with the dancer celebrating Sweet Auburn through her body as Tyson reads the closing of the poem honoring the resilience of this historic neighborhood. 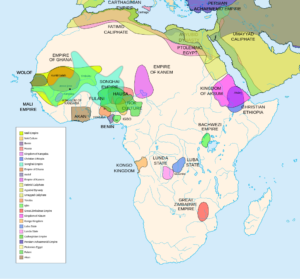 The first film really captures the theme of the museum exhibits, which is apparent in this quote from renowned African-American scholar, Asa Hilliard: “Whatever you do, . 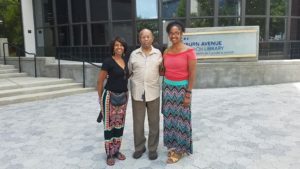 . . don’t let them begin our history with slavery.” Our tour guide began our tour by introducing us to a Black History Timeline. Like the film, the timeline starts again in ancient Egypt. 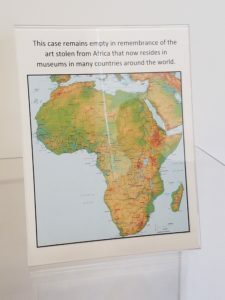 One item on display hanging above the timeline that I had never seen is a map of pre-colonial Africa,followed by another map of Africa post-Berlin Conference. Opposite the timeline stand two black male mannequins, and Zema, our tour guide, asked the children in our group to identify the differences between them. One was missing some fingers and was more restrictively chained. She discussed these differences with the kiddos before she gave everyone in our group the chance to walk through the recreated “Door of no return,” which she’d explained earlier. 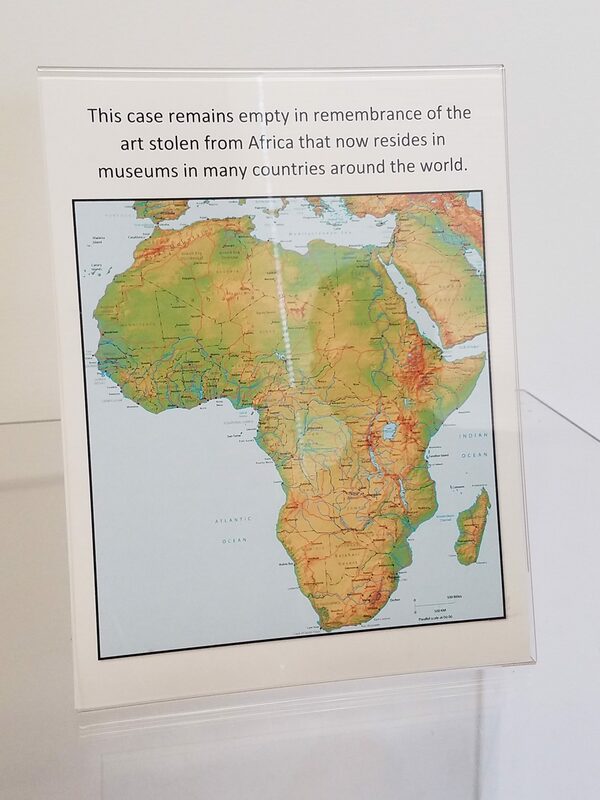 Naturally, the next phase of the exhibit is the middle passage. Zema explained the circumstances under which the captives were transported. 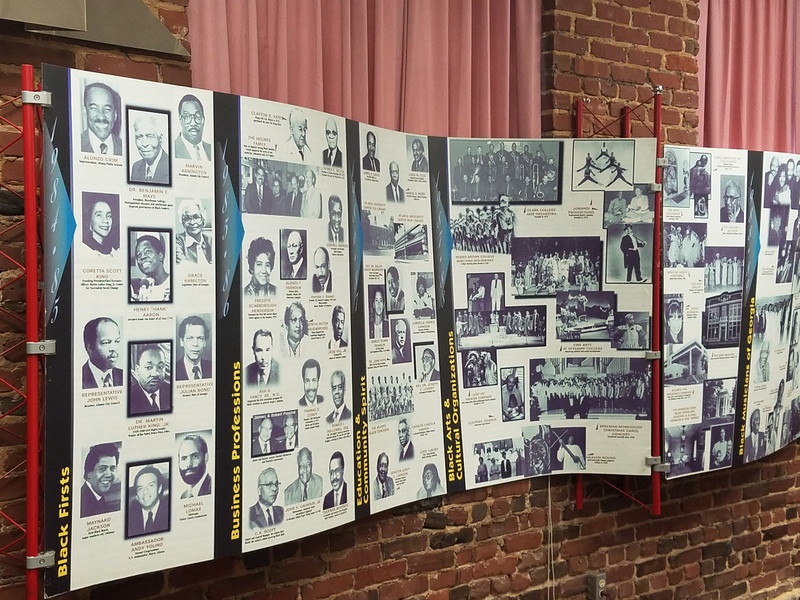 Next, she pointed out the advertisement for Negroes for Sale blown up wall sized. There is also a property record that lists the names of over 100 slaves from one property. Another point made on our tour was that the APEX Museum receives no state funding. Later, I spoke with a few employees who lamented the museum’s ongoing financial struggles. Black museum aficionados everywhere are hopeful that the opening of the Smithsonian’s National Museum of African-American History and Culture in September of 2016 will give other museums more visibility and support. 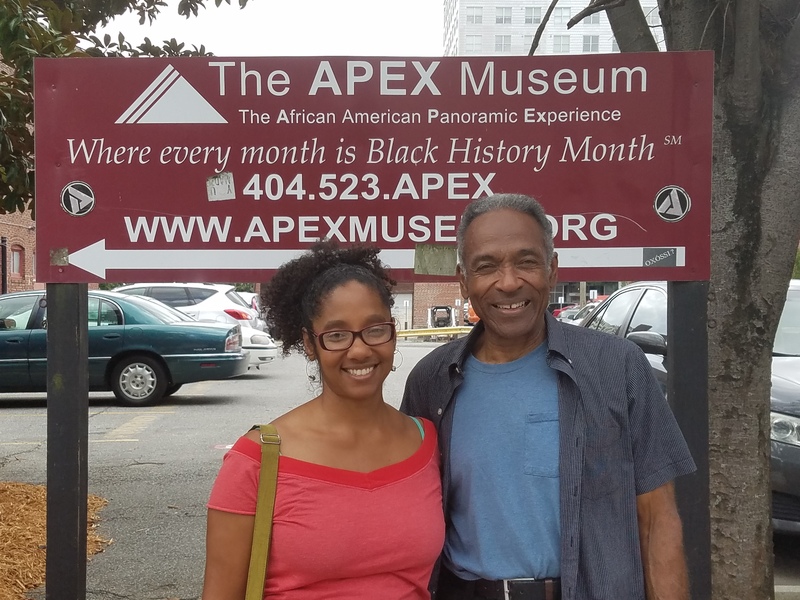 As we left the museum heading to the Auburn Avenue Research Library next door, we were fortunate to encounter the APEX Museum’s founder and president, Dan Moore along with the museum’s storyteller-in-residence, Deborah Strahorn. I explained Our Museums to them, and they were enthusiastic and encouraging. Mr. Moore even offered to help me publish a book as soon as I’m ready. What stands out most about the APEX Museum is that “Panoramic Experience” in the name. The museum seeks to accentuate the connection between today’s African-American culture and ancient African civilizations. 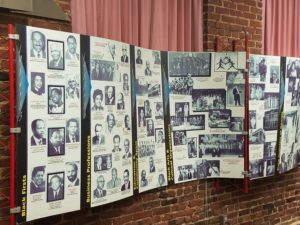 It offers a strengths-based version of Black History rather than focusing on Black folks as victims. With limited resources, it offers multi-dimensional exhibits and programming. 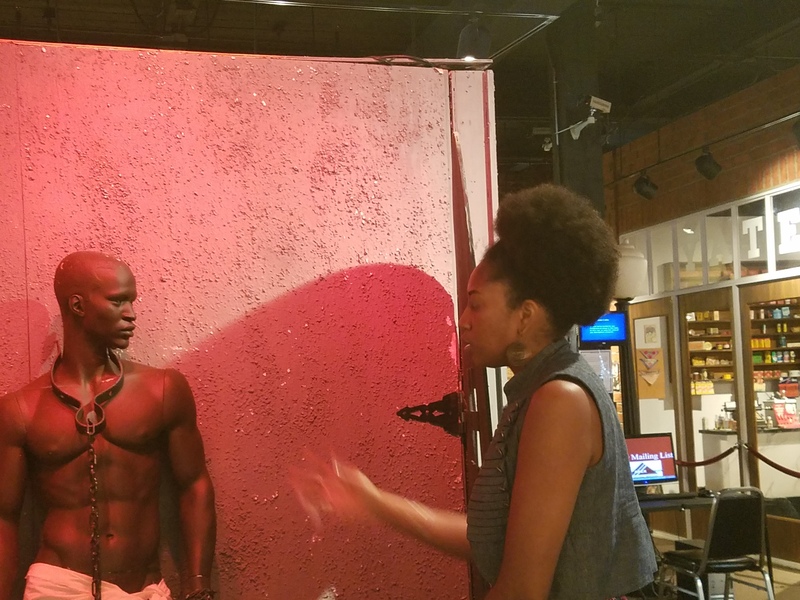 Amidst the state-of-the-art Museum for Civil and Human Rights and the internationally known King Center, the APEX is in a tough spot competing for visitors, but take the time to go when you are in Atlanta. I assure you that you’ll get something new. Check back to read about my visit to Hammonds House Museum, another Atlanta gem.